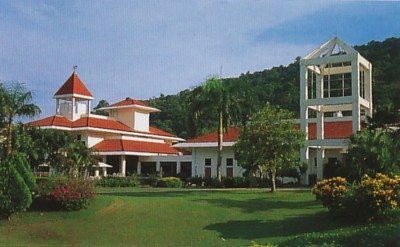 Another all together different low cost golf holiday option is to consider staying at one the many golf resorts which are located throughout Thailand. Many of these resorts host excellent courses, with both hotel and apartments for rent at the course. Some will have additional facilities such as a swimming pool, fitness and spa’s, and for the standard available, the prices tend to be more favorable then traditional hotels located in the in the vicinity. Other advantages include specially priced green fees for in-house guests, elimination of daily transportation costs (since you will be staying at the course already),and sometimes the option to pay a flat green fee that entitles one to play as many holes as you can fit in one day for a fixed price. All of these options mentioned so far are not however for the faint of heart. It will take some Thai language skills as workers at these hotels and golf courses for the most part do not speak English and even the sign boards are only written in Thai. Also, getting to and from the hotel and/or golf courses will be difficult as usually the only option will be private taxis. In these cases be sure that your driver knows the way to the golf course before you agree to travel together as you will be a very rare passenger for him indeed. A final thought to consider for budget golf travel in Thailand is that green fees and hotel tariffs are much less in the low season (April to October). In these months you may save as much as 50% as compared to the winter season thus enabling you to take advantage of the better known courses and hotels located in the popular tourist areas, and still stick to a limited budget. However, you must beware that the weather is more unpredictable during this time of year, as mentioned in my post about Thailand weather. By careful planning, and undertaking a bit of research of what is available in Thailand, you have the opportunity to have a great golfing holiday within in a very wide range of budgets. If you would like more information, local expert recommendations, or have anything to mention regarding the suggestions given here, please feel free to drop me an email at mark@golfasian.com or better yet, post a comment here for discussion.